Weekly returns were not appropriate for the relationship. Perhaps INR affects NIFTY at a higher frequency. There is no linear relationship because a rising/falling INR. Changes are not uniformly good/bad. 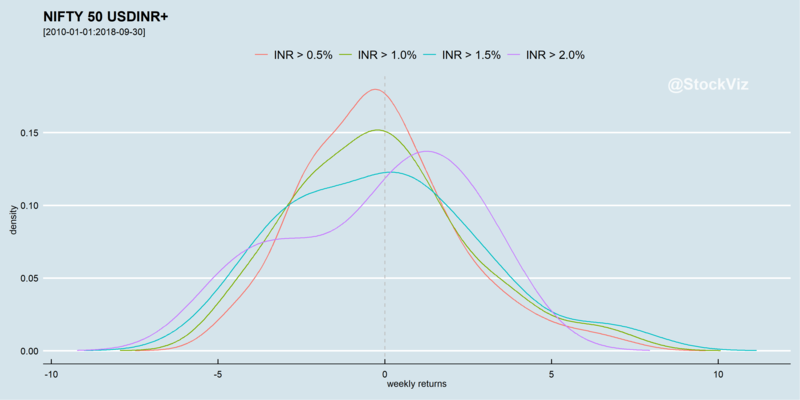 One way to visualize it is to plot the NIFTY returns density at different USDINR return thresholds. If there is no obvious difference in the densities between NIFTY returns when USDINR is positive vs. when it is negative, one could conclude that there is no straight forward relationship between the two. 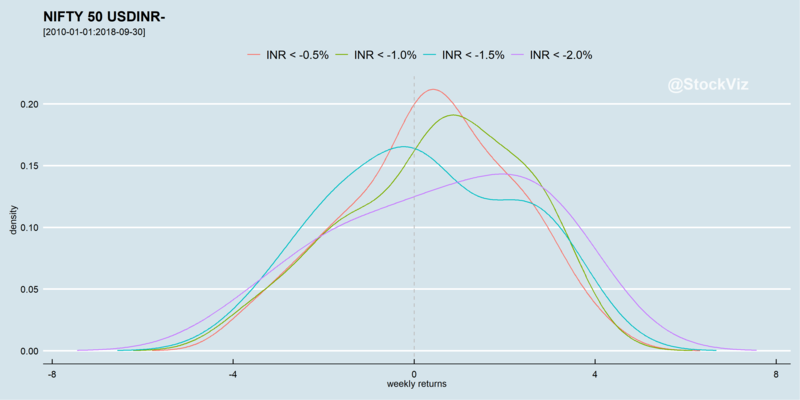 Note the curve when USDINR weekly returns are greater than 0.5% vs. when are greater than 2%. There is a bearish bias. If you juxtapose the above densities, it is apparent that when the rupee is appreciating, the densities skew right, And when the rupee is depreciating, there is a left skew. These charts show that there is “a” relationship – just not what can be captured by a linear model. Code and density plots for NIFTY vs. OIL can be found on github.